Stella's entire oeuvre can be understood through the desires to simplify, reduce and then re-expand from the most fundamental reality. While his early works sought to conjure the atmospheric effects of Mark Rothko, they also possess an interest in geometric equivalences of Piet Mondrian. From these early explorations, he would progress to the Black Paintings which allowed him to fully focus on the materiality of the paint on the canvas. In the early 1960s, Stella's artistic practice would lead him to discover the format of the square, and with the use of color, he would fully engross himself into the subject. 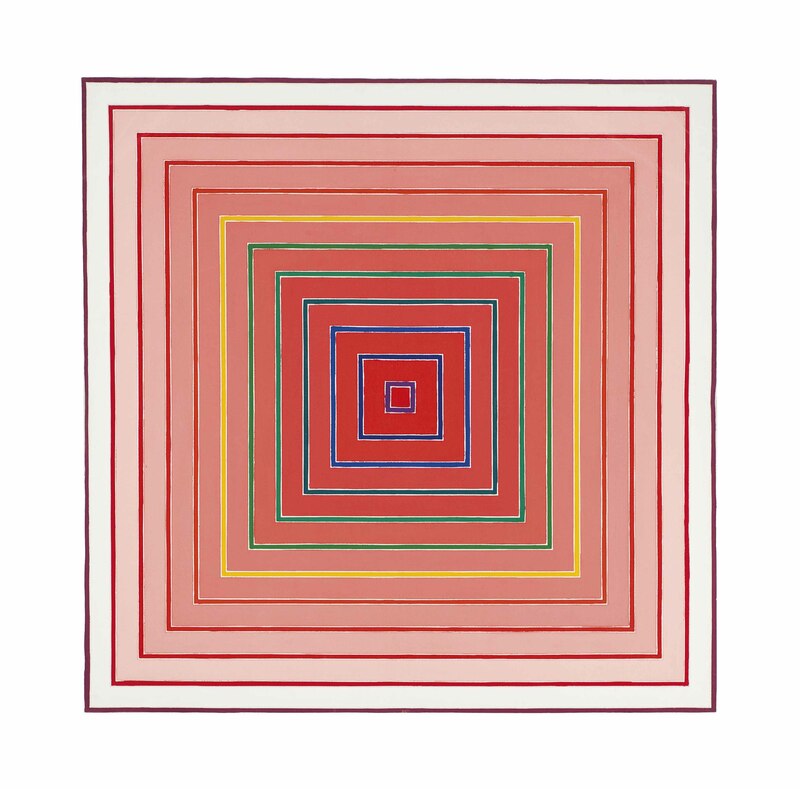 By the 1970s, a baroque thread had appeared in Frank Stella's work. While his voluminous sculptural paintings began to dominate his output, the artist nonetheless continued to develop the Concentric Squares series finding comfort in the essential minimalist qualities of this format. The release that his other work allowed him appears to have given his minimalist paintings new life as Stella refreshed and increased his understanding of their pictorial flatness. As Stella himself said: "The Concentric Squares created a pretty high, pretty tough pictorial standard. Their simple, rather humbling effect, almost a numbing effect, became a sort of 'control' against which my increasing tendency in the seventies to be extravagant could be measured"(W. Rubin, Frank Stella 1970-1987, New York 1987, p. 48). Painted in 1978, Frank Stella's Sacramento Mall Proposal #1 is an elegant and impressive example of the culmination and reprisal of the Concentric Square series. Measuring 103 in. square, the immense Sacramento Mall Proposal #1, represents Stella's return to the contemplative nature of the square, re-visiting the innovative subject of his early work. With eleven concentric bands radiating out from a central point, the symmetrical format is captivating. The gradations of red tones - gradually darkening towards the center - evoke a sculptural quality and defy the two-dimensional limitations of the canvas. In contrast to the varying shades of red, bold thin bands of color fill the thin gaps between the squares -shifting from blue, to green, yellow and then red - heightening the tunnel effect of the underlying composition. The overall subtle, but specific, use of color focuses the viewer on the composition and the sheer scale of the canvas. Keeping in mind that Stella's primary focus was not the colors he chose, but the structure beneath the pattern, Sacramento Mall Proposal #1 clearly demonstrates Stella's successful use of the medium to give the varying planes character and unify the composition; the support and the paint are the heart of the configuration. "After all the aim of art is to create space-space that is not compromised by decoration or illustration, space within which the subjects of painting can live" (F. Stella quoted in, S. Everett, Art Theory and Criticism: An Anthology of Formalist, Avant-Garde, Contextualist and Post-Modern Thought, New York, 1995, p. 246). Unflinchingly hard-edged and eschewing expressive gesture, the concentric squares repudiate the notion of the artist's hand as a signifier of meaning, yet it is clear that Stella's work grows out of his New York School forebears. The Concentric Square series is an important link between the work of reductive abstract expressionists like Ad Reinhardt and Barnett Newman and the minimal artists such as Donald Judd and Dan Flavin. Stella's focus on the concentric squares is emblematic of a powerful summation of the Minimalist project that would align him with his peers of that era. Individually, they would take Modernism to its most pure and logical extreme while opening the door to new aesthetic possibilities by paring down their visual language to the barest of essentials. Working with modular forms and mathematical progressions, these artists were able to expand upon art's possibilities in ways that would help to define an era and extend its influence from art to design and from the regional to the transcendent.